Archaeological Gleanings in the neighbourhood of Codnor Castle. F. Channer Corfield, J.P., of Ormonde Fields. Any Text that appears in blue below, indicates an entry by the journal editor were he considered certain elements of the article required further explanation. An astirix* is used to indicate the section it refers too. The Rev. J. Charles Cox, LL.D., in his "Churches of Derbyshire " (Vol. 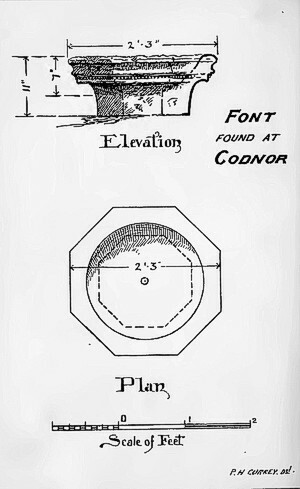 IV., p. 240), states that there was a chapel attached to the extensive castle of Codnor in Heanor parish. There seems to be no very clear evidence of the existence of this chapel beyond tradition and the discovery of a few relics of an apparently ecclesiastical character on the supposed site. 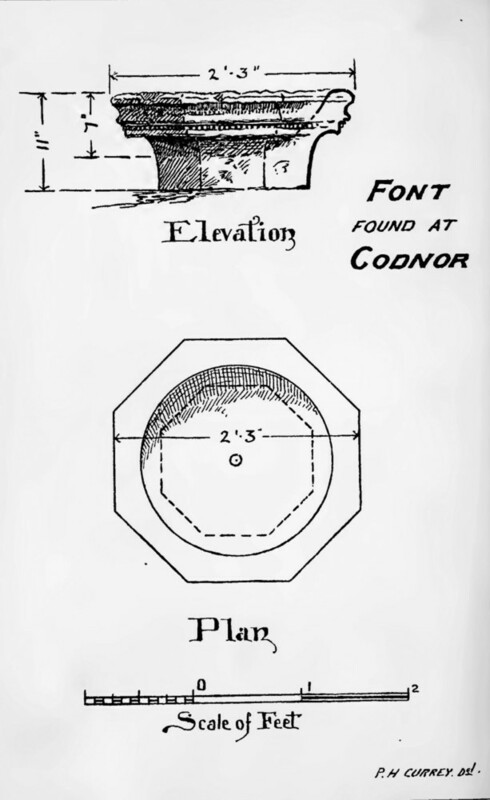 These remains, consisting of a font,* a key, a female head carved in stone, something like the termination of a label, and some indications of interments were discovered about forty yards to the north of the ancient dwelling-house at Ormonde Fields, and about 500 yards west of the castle on the edge of " Church Close," ** a field which has borne this name for generations, as is attested by the title deeds of the Ormonde Fields estate. The font was dug up in 1834 by a labourer named Hicking, of Codnor, then employed by Mr. Samuel Woolley, a former owner of the property, in a spot pointed out to the Rev. Fred. Corfield, late rector of Heanor (1866 — 1879) by Mr. Woolley. This interesting relic remained for some years in the garden at Ormonde Fields until the death of one of the owners of the property, when it was taken by Mr. Starbuck, a relative of the Woolleys, to a farmhouse at Codnor. After Mr. Starbuck's death it was removed to Heanor, about the year 1870, by Mr. J. S. Woolley, surgeon, where it remains in the possession of his widow. At the time of the discovery of the font was found the head of a female quaintly carved in stone, now in the hall at Ormonde Fields. It is of excellent workmanship, and was originally about nine inches in length. It exhibits a square head-dress, with lappets characteristic of the costume worn about the end of the fourteenth century. There can be no doubt but that interments have taken place in Church Close, for several inhabitants of Codnor now living have seen human remains and parts of coffins disturbed when the iron-stone mines were worked here some forty or fifty years ago. crumbled away as soon as touched. The vault was afterwards filled with other coffins taken from beneath the old square pews, and lying above the present floor level, and a gravestone having been placed over the entrance, the whole was covered with concrete. was buried ye 8"" day of februarie." " 1610. Sir John Zouche Knight was buried ye 3rd day of Aprill." Zouch Barron was buried ye third day of Aprill." & Iszabell his wife was buried ye 15th day of Januarij." Zouch was buryed the xixth Daye of Marche." 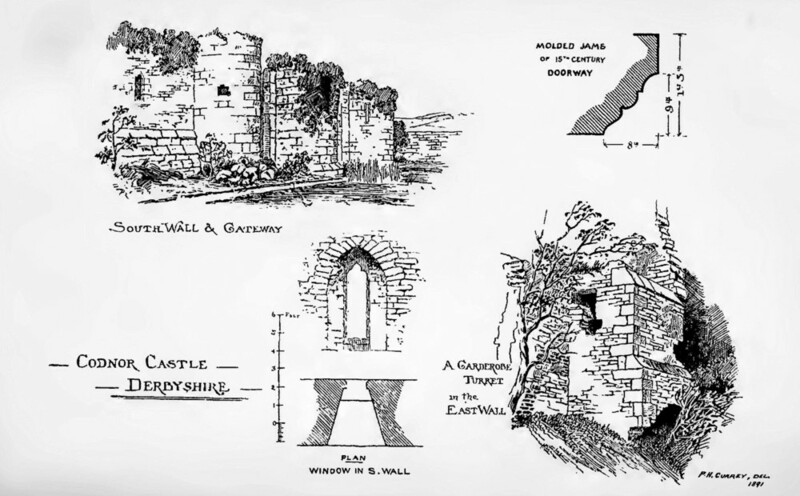 kindly supplied to the Editor by Mr. R. Burton, though there was no probable affinity between these and the old family of Zouch, owners of the castle. Chiistened ye vjth day of Aprill." baptized Thomas the xvi Day of October." Castell was maryed March the xxvth." 1673. " Mr Zouch Wilde of Codnor Castle was buried July ye 5th." The Wilde family of Loscoe used the name of Zouch for three generations. They owned a small estate at Loscoe, and leased minerals for their furnaces at Loscoe in 1650. They resided at one time in a farmhouse about half a mile from the castle, and were registered at Heanor as " of Codnor Castle,'' meaning the Liberty of Codnor Castle. It is said that John Woolley, the original clockmaker of Codnor was apprenticed to John Wild, of Nottingham, who probably might be of the family of the Wilds of Codnor. — Ed. * See "Journal," Vol. XIV., p. 20. Castle, knight, was High Sheriff of Derbyshire in 1712, but it must have been as owner of the estate, and not as a resident that he was appointed. There exists a view of Codnor Castle by Buck, printed in 1727 (see "Journal," Vol. XIV., p. 16), and dedicated to the knight's son, Leigh Master, Esquire, and it seems hardly credible that twenty-five years before the view was taken, the place should be inhabited by the Lord of the Manor with his retinue, though it is stated in Glover's " History of Derbyshire," Vol. II., p. 307, "that Sir Strenysham Master resided here." Lysons, however, from whom Glover probably copied, does not say so. It would probably be of interest, when dealing with this subject, to give a few notes with reference to the title of the Ormonde Fields estate, upon which the old chapel stood. This property, no doubt, formed part of the estates of the Warners, lords of Codnor, soon after the Norman survey, whose family appear to have ended in an heiress Isolda,* who carried the estate to her husband. Sir Henry Grey, knight, who lived at Codnor Castle in 1208, and the property probably remained in that family till it was alienated by one of the Greys to the family of Clarke. The date of this alienation is uncertain, but it was probably at the time or soon after the decay of the chapel. It is certain that the heirs of the Greys in the Castle estates had no footing here, and the Clarkes were no doubt retainers or dependents of the Greys. Clerk was one of the same family, though it is only fair to suppose that he was.) The fact of the boundary of this property being so close to the castle, and that the chapel stood on this estate, seems to me clear evidence that these lands were granted by the Greys to one of their retainers, and no doubt the John Clarke, park ranger, or his ancestors, obtained a footing here from the Greys. The boundary between the two properties (Codnor Castle and Ormonde Fields) is still known as the Buck Leap, and the Lord of the Castle claimed the right to take game and fell trees twelve feet beyond the fence, into what is called the Scarlet Closes, so named by tradition from a bloody battle having been fought there between the Greys and a neighbouring lord, who attempted to break down the castle and kill the lord thereof. Several of the inhabitants now living, who have heard the tale from their forebears, have given me details of this battle, and, curiously enough, each told the same story. I have not seen any early pedigree of the family, or do I know what relationship there existed between the Clarkes of Somerall, in the parish of Brampton, and those of Codnor, beyond the marriage mentioned below. * To show the difficulty in tracing so common a name as Clarke, I have searched the list of wills at Lichfield, and find that from 1562 to 1586 there are no less than thirty-three wills of Clarkes, and six of them are John Clarke. Codnor, gent., in the year 1633, who died Ann° Dom' 1641, et Ano AEtates 88. ** Godfrey Clarke, Esq., purchased the manors of Normanton and Sutton about 1742, from the heirs of the last Earl of Scarsdale. and in addition to his own. The Codnor and Heanor part of the estates, comprising about 1,000 acres, were sold by the powers of an Act of Parliament by the trustees of the Marquis of Ormonde ; but the Codnor portion of the Estates on which the Chapel stood was sold to Samuel Woolley, of an old yeoman family long settled on their own lands in the neighbourhood, on the 7th April, 1827, and he left the estate to his eldest son, bearing his own name, who died in 1888, having directed his property to be sold. It was purchased on the 23rd February, 1889, by Frederick Channer Corfield, eldest son of the Rev. Frederick Corfield, J. P., late Rector of Heanor, of a family long seated at Chatwall Hall, in the Parish of Cardington, and before 1530 at Corfield, on the river Corve, in Corvedale, all in Shropshire. became possessed of certain estates by marriage with the grand -daughter of G. B. Clarke, Esq. This is clearly a mistake. Godfrey and John both living and Ellen who died young. He gave him lands and riches store Which he bequeathed to Friends and poor They have his goods : his corps this stone Doth hide : his soule to heaven is gone. Virtu post funera uiuit."